On Aunt Mildred's Porch: If I Wanted Tropical, I'd Move to the Tropics! If I Wanted Tropical, I'd Move to the Tropics! "The Tropics" . Does anyone even say that anymore? Is it even politically correct? It sounds like a word of the past. A phrase we can't say anymore because people who live in tropical areas took offense that we lumped them together. I can't say I've heard someone under the age of 60 say "the tropics" in recent years, so I'm thinking it might not be a real phrase for today's generations. ...we're getting warnings about a tropical storm due to hurricane Arthur. Hurricane worries in the summer are nothing new around here, but early July is way too early. Tropical storms for us are usually filled with lots of rain, sometimes really hard rain, and windy gusts that move patio furniture around and break some sticks off of trees. And, while we probably won't get a hurricane, lots of wind and rain will just wreak havoc with all these pretty flowers! My favorite right now is this one. This purple/blue is some unnamed flower that I bought just enough of to make 2 baskets. It spills out over the basket and every morning has amazing color. By evening, the flowers seem to die off and then it regenerates in the morning. I bought it at the grocery store and when I went to get more there was nothing even close to it. I was pretty crushed because when I saw how it behaved, I wanted to put it in all of my baskets. There was something kind of like it, but it was too purple, the flowers were smaller and it already looked like it had a lived a whole summer and it was only June. If you think about it, blue isn't really a color we see in flowers, naturally. When I was in Belgium one summer, everyone seemed to have tons of this color and their window boxes were like calendar pictures everywhere we went. I've been on a quest to find it ever since but I don't usually succeed. I also don't usually do hanging baskets well. I usually don't put enough plants because I always think they will fill out but then for like 2 months of summer they just look thin and scraggly. This year, I had to force myself to fill the baskets and they really look much better. There's another flower in there called Wee Willy and the 6 packs came with a variety of color mixed in. White, pinks and some deep fuscia. They seem very hardy and happy to be in baskets. I still have my gardens to deal with, but if you've seen one tomato plant, you've seen them all. I don't usually do much with flowers, so I thought I'd share that. And fingers crossed that Arthur doesn't steal all this beauty! I thought I posted a comment but it disappeared. Sorry if it is a duplicate. Pretty sure the blue flowers are lobelia, a favorite of mine. Wee Willies are what we called Sweeet Williams. My dad is Wiliam and he would always plant them in the Mothers Day garden he'd do every year for my mother before she got up. 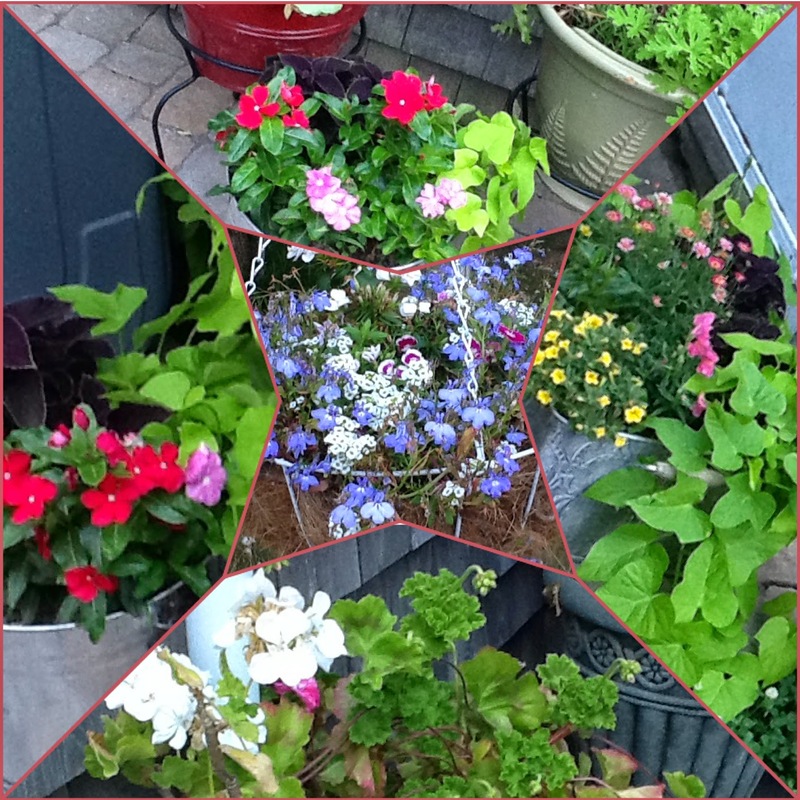 It was full of annuals, pansies, alyssum, marigolds, petunias and sweet Williams. Amazing Salsa Recipe- From The Grocery Flier!